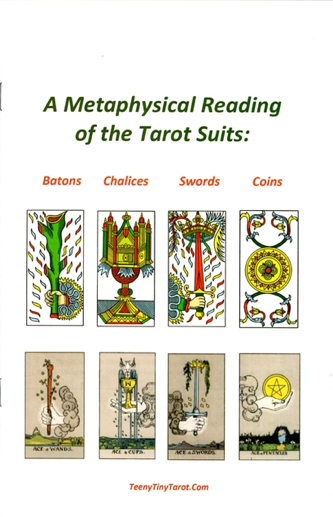 Hermetic Library Fellow T Polyphilus reviews A Metaphysical Reading of the Tarot Suits by TeenyTinyTarot. This anonymous pamphlet was included gratis with an order of cards from the TeenyTinyTarot website. It seems to be composed as more mystical “bait” to reorient those whose interest in Tarot has originally consisted of vulgar divination. Most of it is dedicated to an identification of the four lesser suits with the parts of the soul, using accessible generic language, without e.g. the technical jargon of qabalistic psychology. It is illustrated with parallel images from the CBD Tarot de Marsaille and the RWS (“Rider-Waite Style”) decks. For me, the most interesting content was a couple of paragraph-long quotes (one on the Fool and the other on the Sun) from the anonymous (but of different authorship from the pamphlet) Meditations on the Tarot. The present author offers a disclaimer that “the Anonymous Author of Meditations on the Tarot cannot be appealed to as the authority for (or even the primary inspiration behind) this approach to the tarot suits,” but the AAoMotT is evidently taken here as a chief authority on the tarot generally, and is also quoted as applying the formula of Tetragrammaton to the four suits, after the manner that is familiar to modern Hermetic occultists, and consistent with the exposition earlier in the pamphlet. This entry was posted in Hermetic Library Reading Room and tagged book, review, T Polyphilus, TeenyTinyTarot on September 27, 2017 by John Griogair Bell.